This is a commission slot. 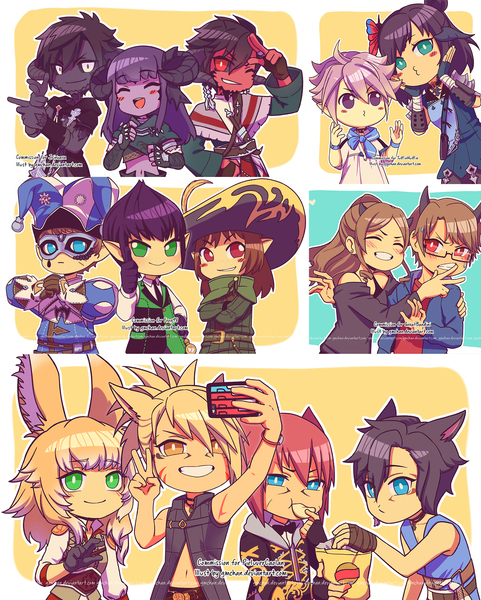 You can hire GMchan to create a personalized artwork of this sort here. It looks amazing! Thank you! I'll be sure to contact you again in the future! Very professional and easy to work with! Thank you!! Great work, the piece was super cute and amazing! The artist was friendly and easy to work with. Very nice and well rounded artist, good listener and eager to please. I rate this a perfect 10/10. Absolutely adorable art, completely recommend. The artist did a great job! GMchan was incredibly fast with finishing the commission. The artwork was lovely and very open to making changes throughout the process. A joy to work with and will certainly be back again. Great Artist! Very fast and such great prices and speed done!! Def. will commission again! Amazing job, and completed the design in such a fast amount of time! The artist is very friendly and professional, open to plenty of feedback, and responds in a timely manner. I will definitely be commissioning them again and recommending them to friends. Super helpful with the process and really nice. I would recommend to anyone. Fantastic artist, very helpful, and did it all in a very timely manner! Would definitely recommend! Swift turnaround, friend demeanor, and adorable result! I definitely recommend! Cool person, with cutie style ! and work fast ? Extremely fast and super easy to work with! 10/10 recommend! Artist was quick, attentive and made a very wonderful piece for me! An amazing job was done! Very good artist! Quick and Responsive! The quality is great for the cost. Beautiful Art style I love It Thank You! GMchan took my concept, and revolutionized this OC of mine with an excellent imagination, and I'd argue, expert color work! This artist has a talent for whispering new ideas into their work! The piece produced by this artist, is well worth the money spent for it's completion. Absolutely beautiful line work. What are you waiting for? Commission GMchan already! Your imagination will thank you! I thoroughly enjoyed the end product, please commission this artist.They're wonderful! Was very kind and gave me updates on each step of the process. The time is a lil long but well ! The finish and style is very beautiful and successful! I strongly advice! *Any alteration can be made within the drafting stage. *Customer may still ask for some color changes or saturation after the illustration is finished. *I'll upload your image with watermark, and when you are satisfied with the work and pay+mark the work as complete the watermark will automatically disappear! *I retain all rights to the artwork. I can post it in my portfolio and online galleries (will post smaller versions only). Even so, client may still ask to keep the commission private if needed. *You cant resell the commission, but you can use it in any other personal use.